If you read any modern book on pysanka making, you will find many references to “aniline” dyes (or “analine” if the author hasn’t spell-checked). While we call the modern chemical dyes we use aniline dyes, they could be better described as “acid dyes” (and are, in the textile community). Why, then, this name? 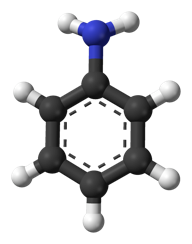 Aniline was first isolated from the destructive distillation of indigo, a plant used to produce blue dye, in 1826. In 1834, it was also isolated from coal tar. 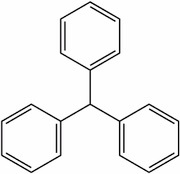 Further attempts by several scientists yielded aniline by different processes and, in 1841, C. J. Fritzsche gave this blue oil the name “aniline,” from the specific name of one of the indigo-yielding plants, Indigofera anil (anil being derived from the Sanskrit nīla, dark-blue, and nīlā, the indigo plant). In 1855 these variously named oils were proved to be identical , and thenceforth they took their place as one body, under the name aniline or phenylamine. 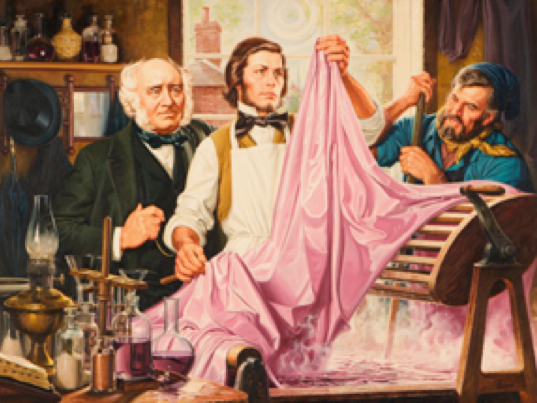 Its first industrial-scale use was in the manufacture of mauveine, a purple dye discovered in 1856 by an 18 year old chemistry student, William Henry Perkin, who was trying to create artificial quinine (an anti-malarial drug). At the time of mauveine's discovery, aniline was an expensive laboratory compound, but it was soon prepared "by the ton" using a process previously discovered by Antoine Béchamp. The synthetic dye industry grew rapidly as new aniline-based dyes were discovered in the late 1850s and 1860s. These new colors were not only relatively easy to produce, but were quite bright, even garish. The muted dyestuffs of earlier decades gave way to bright prints. Mauve was found to fade very easily–when first applied it is a bright purple, and only after fading is it the light, lavender color that we associate with the name. And mauve gave its name to an entire decade – the 1890s. Purple had once been the rarest and most difficult dye to prepare; Tyrian purple was prepared from the secretions of a predatory sea snail, and was incredibly expensive. With mauve, anyone could afford purple, a color once limited to kings. Aniline itself is a very toxic substance. The dyes we use today are much less toxic than aniline. The greatest risk of disease or injury due to modern acid dyes is by ingestion of or exposure to dye dust. These scenarios are normally confined to textile workers. Whereas the dye itself is normally non toxic, the molecules are metabolized (usually in the liver) where they may be broken back down to the original intermediates used in manufacture. Many intermediate chemicals used in dye manufacture have been identified as toxic and their use restricted. 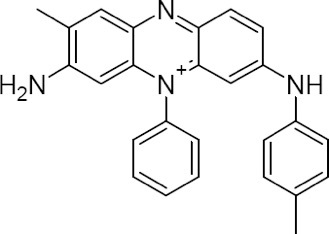 The structure of azo dyes is based on azobenzene, Ph-N=N-Ph. Although Azo dyes are a separate class of dyestuff mainly used in the dyeing of cotton (cellulose) fibers, many acid dyes have a similar structure, and most are red in color. Acid dyes having structures related to triphenylmethane predominate in the milling class of dye. There are many yellow and green dyes commercially applied to fibers that are related to triphenylmethane. Acid dyes are thought to fix to fibers by hydrogen bonding, Van der Waals forces and ionic bonding. They are normally sold as the sodium salt therefore they are anionic in solution. Animal protein fibers and synthetic nylon fibers contain many cationic sites, therefore there is an attraction of anionic dye (- charge) molecule to a cationic site (+ charge) on the fiber. The strength (fastness) of this bond is related to the “desire” of the dye to remain dissolved in water over fixation to the fiber.